You were born to shine darling. Do not hide your fire. Sometimes we need a classy kind of outfit for a really important meeting, or presentation and personnaly I always struggle with that, especially that I do own like 2 or 3 classic tops ( yes I have a problem I gotta buy more) but anyway ! for this outfit I tried to mix some classic and casual items to make it too like professional haha I'm wearing this beautiful blazer from Fashion mia that you can style with any outfit you want and still looks great : with jeans, skirts, a dress also , whatever you want .The pants are highwaisted with those laces on the front because I love it when there's cute details on my outfits. 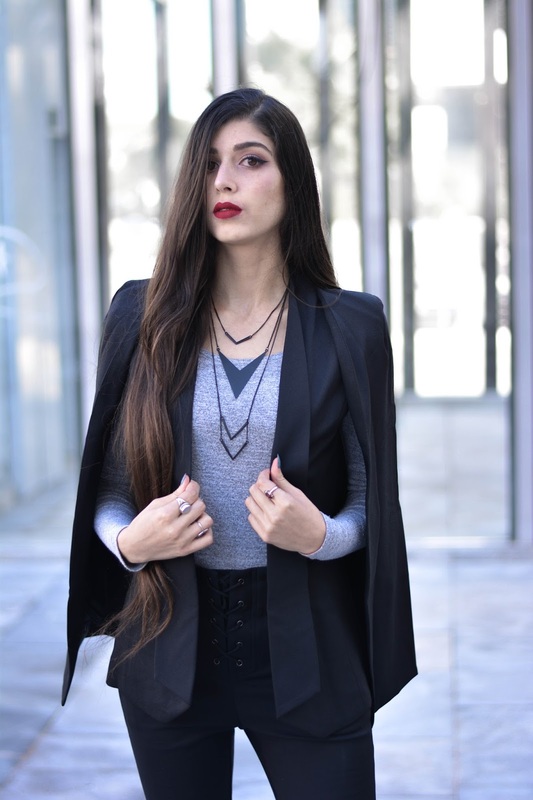 The top is a gray body suit, it's here to give a little pop of color since i'm wearing all black, and to show the necklace, the blazer and pants details ! it can be any color you want as long as it's clear enough to make the black details show up. For the shoes i usually go for high heels but sometimes it's painful so i bought those cute glossy shoes from marwa and i'm loving them ! they're perfect for a classy look as well as a casual one, light and comfy ( except for the first days i had blood everywhere) they can help in this kind of situations.